Using our Dermalogica skin care line, we will create a treatment unique to your skin care needs and concerns. We are trained to counter the effects of aging, hyperpigmented and acneic skin as well as address the special needs of teen skin. 30 minutes. Express treatment: Cleanse, Exfoliate and Tone. 60 minutes. Relaxing treatment: Cleanse, Exfoliate, Massage and Tone. 90 minutes. 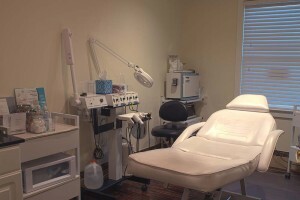 Allows more time for intensive extractions, massage or the use of Electronic Modalities. 30 minutes. Firm, Tone, Brighten tired eyes. 30 minutes. Stimulate circulation while smoothing skin. 45 minutes. De-Stress your muscles and cleanse skin impurities.